We learned how we can scan objects (and even ourselves) to create 3D models which we can print. We scanned and printed busts of ourselves. In order to get the scan, the model needed to keep absolutely still as the scanner moved around the person. The model must be kept in the center of the visual field at all times or the scanner would lose track of what it was scanning. Every surface angle needs to be captured. If there are any holes that were not captured in the scanning process, these can be filled in and smoothed out in Meshmixer. Meshmixer is useful for modifying your 3D model and preparing it to be “printer ready.” The object must be on a completely flat surface, otherwise extensive supports will be required to print. 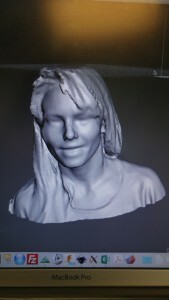 While printing a bust of yourself is not exactly that useful, this technology could be very useful if you wanted to print an object or part that you already had. Instead of redesigning the object from scratch, you could simply scan the object. I may try that this summer with one of the medical school’s skeletons.